WHAT IS IT? This weird, emotionally energetic style of politics that promises “transformational” change and then, mysteriously, fails to deliver it? . . .
Nameless though it may be, few would deny that Jacinda Ardern is its most brilliant local exponent. . . . So effective are “Jacinda’s” communication skills, that a great many New Zealanders have taken to confusing her declarations with actual achievements. Those who point out the discrepancy between the Prime Minister’s magnificent words and her government’s less-than-magnificent deeds are not well received. But, that does not mean they are wrong. . . So richly evocative of selfless activism and against-all-odds success was her declaration that Ardern’s audience’s critical faculties were suspended. Almost as if the promise and the deed were one and the same. Some people might call what she did “casting a spell”. Others, even more provocatively, might call it “magic”. But, magic of a certain kind. Ardern’s are not the sort of spells that begin with fantasy but end in reality. Jacinda is no Churchill. Rather than a magician, she is a conjurer. What Ardern weaves with her words are not the intentions that lead to actual deeds, but the dangerous illusion that what is being asked of her has already been accomplished – made real by the unmistakable sincerity and the power of her will. Once she has declared her determination to end child poverty, who could be so churlish as to point out that the children of the poor are still with us? Ardern’s conjuring is perfectly suited to that crucial group of voters who detached themselves from the National Party in response to what they saw as the “awful” problems which John Key and Bill English had failed to address during their nine years in office. . .
Ardern’s game-changing intuition was that all these voters really wanted to hear were different words. Commitments, promises, studies, working-groups, projects: policies filled with good intentions and promoted with powerful displays of empathy. The number of voters eager to focus on the fiscal mechanisms required to pay for Labour’s kinder, gentler New Zealand were considerably fewer. . .
It’s not that “Jacinda” has become less likeable. . . It’s just that Ardern’s “Magic Politics”, as with all kinds of fiction, is absolutely dependent on the audience’s willing suspension of disbelief. She’s very good with words, especially those that touch emotions, but it’s only words and empty words at that. Change and progress require more than empty phrases. They require decisions and actions. The government is nearly half way through it’s term and what has it done to make a positive and sustainable difference to New Zealand? This government, and it’s leader have over-promised and failed to deliver. 39 Titus, Roman emperor was born (d. 81). 1066 Granada massacre: A Muslim mob stormed the royal palace in Granada, crucified Jewish vizier Joseph ibn Naghrela and massacred most of the Jewish population of the city. 1460 Wars of the Roses: Battle of Wakefield. 1834 – Church Missionary Society printer William Colenso arrived in the Bay of Islands on the schooner Blackbird with New Zealand’s second printing press. 1835 Charles Darwin left New Zealand after a nine day visit. 1865 – Rudyard Kipling, English writer, Nobel laureate, was born (d. 1936). 1875 – A.H. (Sir Alfred Hamish) Reed, publisher, author, entrepreneur, and walker and mountaineer, was born (d. 1975). 1916 The last coronation in Hungary was performed for King Charles IV and Queen Zita. 1919 – Lincoln’s Inn in London admitted its first female bar student. 1922 Union of Soviet Socialist Republics was formed. 1925 – Ian MacNaughton, Scottish actor, producer, and director, was born (d. 2002). 1924 Edwin Hubble announced the existence of other galaxies. 1927 The Ginza Line, the first subway line in Asia, opened in Tokyo, Japan. 1928 – Bo Diddley, American singer and musician, was born (d. 2008). 1931 Skeeter Davis, American singer, was born (d. 2004) . 1937 – Noel Paul Stookey, American folk singer (Peter, Paul & Mary), was born. 1939 – Glenda Adams, Australian author and academic, was born (d. 2007). 1940 California opened its first freeway the Arroyo Seco Parkway. 1942 – Michael Nesmith, American singer and musician (The Monkees) was born. 1944 King George II of Greece declared a regency, leaving the throne vacant. 1945 Davy Jones, English singer (The Monkees), was born (d. 2012). 1946 – Patti Smith, American singer-songwriter and poet, was born. 1947 King Michael of Romania was forced to abdicate by the Soviet-backed Communist government of Romania. 1947 Jeff Lynne, English musician (ELO), was born. 1948 The Cole Porter Broadway musical, Kiss Me, Kate (1,077 performances), opened at the New Century Theatre and was the first show to win the Best Musical Tony Award. 1950 Bjarne Stroustrup, Danish computer scientist, creator of C++, was born. 1953 The first ever NTSC colour television sets went on sale for about USD at $1,175 each from RCA. 1959 Tracey Ullman, English actress and singer, was born. 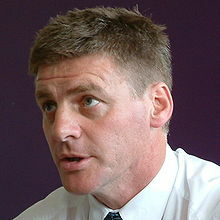 1961 – Bill English, New Zealand’s Prime Minister, was born. 1965 Ferdinand Marcos became President of the Philippines. 1975 Tiger Woods, American golfer, was born. 1993 Israel and the Vatican established diplomatic relations. 2004 A fire in the República Cromagnon nightclub in Buenos Aires, Argentina killed 194. 2005 Tropical Storm Zeta formed in the open Atlantic Ocean. 2006 Madrid’s Barajas International Airport was bombed. 2006 Deposed President of Iraq Saddam Hussein, convicted of the executions of 148 Iraqi Shiites, was executed. 2009 – The last roll of Kodachrome film was developed by Dwayne’s Photo, the only remaining Kodachrome processor at the time, concluding the film’s 74-year run as a photography icon. 2011 – Owing to a change of time zone the day was skipped in Samoa and Tokelau. 2013 – More than 100 people were killed when anti-government forces attacked key buildings in Kinshasa, Democratic Republic of the Congo. Sourced from NZ History Online, Te Ara, Encyclopedia of NZ & Wikipedia. The library tells me I’ve spoken 1,000 times in the House; answered or asked 2,000 questions and answers; I suspect probably about 10,000 interjections, 23 of which were witty. Enough of the numbers, the strongest feeling I have today, in this last speech, is gratitude. That is, gratitude for the opportunities that I’ve had, for the many people I’ve served with, but, most importantly, for the many moments of connection and witness to the lives of others, which I believe is the deepest privilege of public life: to see the joy of their achievement, to see the courage in their suffering, and to be grateful for the strength and the wisdom given to me by so many. . . I became National’s electorate chair for Otago about the time Bill first entered parliament, and he was one of “my” MPs when I was the party’s southern regional chair. Tonight I am grateful that we have people who are willing to represent us and serve us; people who work to make life better for individuals and the country; people who care, know that caring in itself isn’t enough and work hard to make a positive difference. I am especially grateful for the pleasure and privilege of working, albeit in a very small way, with and for Bill.